The Paris Talks Conference is 15 March, just a month away. This is the second year for the event created by Expats Paris’ Michael Bihati and his crew. Paris Talks is pretty ambitious, all about BIG ideas regarding the future of humanity. Those who attended the first edition know what to expect (though there are a lot of surprises being worked up for this year). So Michael just sent us a rundown of what you can expect for 2019. The Paris Talks conference 2019 edition will take place on 15 March from 13:00 pm to 22:00 Paris time. UNESCO, 7 Place de Fontenoy, 75007 Paris. The Paris Metro Station will take you to the Unesco. Taxi, Chauffeur Privé, bike (Vélib’) or Uber are other options to be explored! CityMapper is a great app to figure out your best route. UNESCO does not offer parking facilities. We highly recommend using public transport. What will be the conference language? Paris Talks will be entirely in English. though there will be speakers of many languages at this multicultural event. After all, the future of humanity knows no language or cultural boundaries! 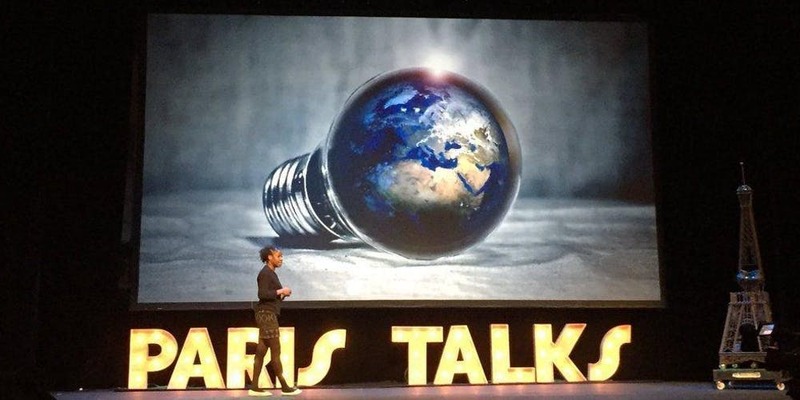 Paris Talks is designed for decision-makers, inventors, entrepreneurs, educators, scientists, environmentalists, economists, artists, futurists… and anyone curious and interested in connecting with other curious and inspiring minds. Who will be speaking at Paris Talks? Most of the Paris Talks speakers are entrepreneurs, thought-leaders, scholars, forward-thinkers and hold decision-making positions in their respective organizations and businesses. What are some of the most highly-anticipated “hot talks” that I shouldn’t miss? Failing Global Leadership: Lessons From Brexit! Are We Prepared For Nuclear War? Organizers advocate different ways of learning: reading blogs, listening to podcasts, watching youtube videos, and attending webinars, just to name a few. But there’s something totally unique about an in-person event. There’s the personal networking, the excitement of seeing live speakers, and the contagious atmosphere of excitement and learning that you just can’t find anywhere else. All this makes Paris Talks one of the best opportunities to learn, grow, and take your game to the next level. Here are the 10 reasons why you should attend. The future of Conflict in the World sounds like a pretty massive subject. How will Paris Talks cover it all? Paris Talks will take you into the future of humanity through seven main sectors that include Technology, Humanities, Science, Environment, Education, Art and Design, and Economy. You can find more details on all these themes here. By exploring these sectors, PTC will identify potential sources of future conflicts (worldwide and locally). In breakout working group sessions, attendees will be invited to deeply think and generate ideas, solutions and methods on how to tackle or fix these coming conflicts. I can’t attend the entire day. What should I do? If you’re unable to attend the entire day for one reason or another, RSVP and join when you can. Your place will be kept for you. How much is a ticket to Paris Talks? Tickets start at 34.22 for students, and you can get yours here. Important Note: Once tickets are gone, they’re really gone. The Paris Talks curation team doesn’t hold any tickets back for higher-priced sales later, nor do they sell tickets at the door. All Paris Talks tickets are non-refundable. Transfers and name changes are available for free up to one month before the conference. After February 15, 2019, no further transfers or name changes will be possible. All information related to Paris Talks ticket purchase, refunds and transfers is on this page. Can I sponsor Paris Talks or donate something to your attendees? The aim is to minimize or avoid sponsorship at the Paris Talks conference in order to focus more fully on creating a great experience for our attendees. Can I volunteer at Paris Talks? The Paris Talks conference runs on the energy of highly-appreciated volunteers. Volunteer applications are open here. You’ll be contacted if we think your skills are needed for this conference right after all the tickets are sold. I’m with a Startup/Non-Profit organization and would like to sponsor some tickets for my employees and business partners. Can I get a group discount? Group discounts may be available. Get in touch with organizers by sending an email to contact@paris-talks.com or direct messaging them on Twitter @ParisTalks. So there you have it … a rundown on the entire conference. Of course, if you really want to know what the event is all about, the best solution is to get your ticket and be there on 15 March.